What's the Best 4K Slideshow Maker Software? How to Create 4K Photo Slideshow Video? Everybody has a treasured collection of photos for special moments, such as birthday party, graduation, wedding and so on. How to keep those photos longer without getting broken? Some people use photo album while some others choose to make a vivid slideshow video not only aiming at preservation, but sharing on SNS or burning to DVD. If you are the one preferring slideshow, we would like to introduce the best 4K slideshow maker which can help you create photo slideshow video with ultra high quality on PC/Mac. • Create slideshow from photo albums to MP4, FLV, AVI, MOV etc, with high quality (4K). • Add background music for slideshow. Customize photo order and interval period. • Also works as HD video converter and online video downloader. Google lists thousands upon thousands of 4K slideshow maker results bringing a difficulty to pick out real reliable one. Despite that most applications announced topping in the market, we should give a careful evaluation based on key points we concern most. We ask for help from third-party software because they can help us achieve task easier. A hard-to-use tool must not be the choice. On the other hand, the 4K slideshow maker with a concise interface and well-organized function buttons is better received. Besides the main feature to turn photos to a slideshow, additional functions of slideshow maker play important roles as well. • Various output video formats can meet different requirements, for example MP4 for devices, AVI and MOV for PC, Mac playback respectively, FLV for uploading online etc. 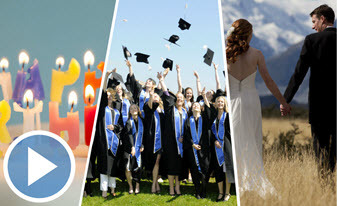 • Suitable background music seemingly increases emotional colors for special birthday, graduation or wedding slideshow. • Editing options and parameter adjustment enables us to customize slideshow with better effect. Some 4K slideshow makers list annoying ads on interface. Some are bundled with unknown adware which may be installed on computer stealthily and hard to be removed. Even, spyware, malware, virus may be piled in. Getting 100% safe slideshow software can keep computer neat and tidy. WinX HD Video Converter Deluxe, mainly focusing on video conversion, is also a well-developed 4K slideshow maker fitting all above standards. It is available to create a slideshow video from photo album to MP4 (H.264/H.265), AVI, MOV, FLV, 3GP etc, with crisp image. It is allowed users to add background music (MP3), sort photo ascending/descending order by file name, date, photo location, set interval period. Parameters including bit rate, resolution, frame rate, aspect ratio can be adjusted depending on your needs. It has been verified as no harm without any malicious stuff to computer. First of all, please download and install WinX HD Video Converter Deluxe on PC (compatible with Windows 10 and lower versions). A Mac version running on macOS Sierra and lower versions are available for Mac users. Step 1. Launch this WinX 4K slideshow maker. Hit Photo button on navigation bar and it will ask you to select a photo album folder for slideshow making. Select the folder and click OK. Tip: You can put all 4K photos you want to create as slideshow into one folder at the beginning. Step 2. Output Profile window pops up. There are several formats classified into different categories, like General Profiles, Device Profile, Web Video Profile, DVD Profile, HD Video. Select one desired format from any category and click OK. Optional. Click Edit button to add music and customize setting. You can also add more photo folders to create as slideshow. Step 3. Browse to set destination folder and hit RUN button to create your 4K photo slideshow. Need a 4K slideshow maker? WinX HD Video Converter Deluxe is a good helper! This WinX 4K sildeshow maker is available to make slideshow video from photo albums with background music to MP4, AVI, WMV, MOV, FLV, WebM etc, while delivering original image quality, helping you share on Facebook, YouTube, Instagram and more, burn as DVD, play on PC/Mac/devices.